Our Christmas order book is still open although availability is for larger sized turkeys. This year we have our bronze and black Christmas turkeys along with ducks, capons and chicken. 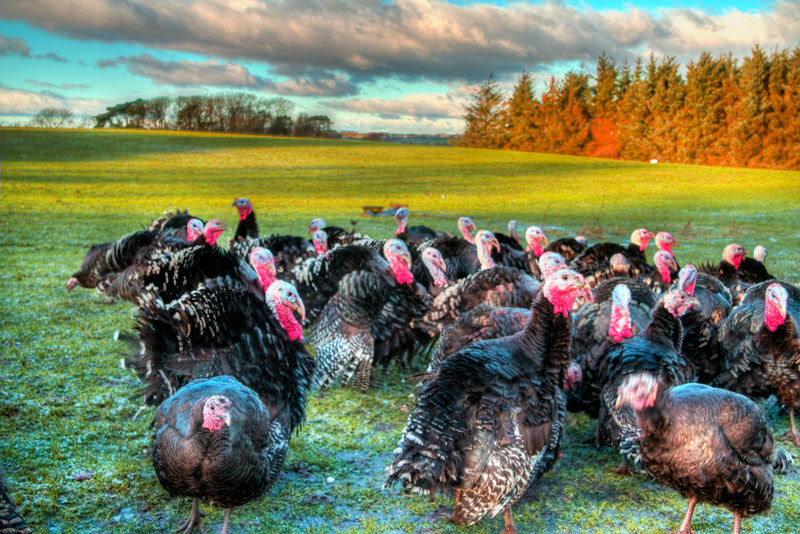 Our first batch of turkeys arrived on the farm at the end of May they are reared outdoors using a natural process. We chose slow growing breeds that thrive in an out door setting where they can spend their time wandering around the farm foraging in the grass for bugs and such, we supplement this with a natural grain diet however they do have a favourite treat – nettles! Encouraging the turkeys to grow at a natural pace promotes both the texture of the meat and their superb flavour. The black turkeys are more akin to the original turkeys and have a mild gamey flavour, they tend to be a little smaller as they grow really slowly. Our free range ducks are quite a treat, order early as we sell out of these very quickly, our capon style chickens are popular for those who aren’t too fussed about turkey and prefer a lovely big chicken with all the traditional accompaniments. Our Christmas Order Sales Page is now open, please click onto our Christmas Order tab and fill out the form, you will then be sent an email with secure payment details, any discount will be applied at that time. When ordering your turkey calculate 450g / 1lb per person which will allow for seconds & left overs. Make sure your turkey will fit in your oven up to 6.5kilo 37cm (l )x 22cm x 20cm (h) / 6.5- 9 kilo 39cm (l )x 30cm(w) x 20cm (h). If you would like your order delivered there will be a £15 delivery charge for mainland UK. Please give me a call on 07760750990 if you would like to discuss your requirements or to place an order or email morrisaj@rocketmail.com.